The Cottage Nursery is a registered charity limited by guarantee providing high quality childcare in the Shrivenham and Watchfield area and runs under the leadership of Managers Clare Olden and Trudi Krzywiec and a Board of Trustees. The nursery is closely linked with the Defence Academy of the United Kingdom and offers places to families attending the college as well as to local residents of the surrounding area. In 1987, Beckett Crèche was started by two mothers with a small grant for toys and some leftover emulsion. It ran every morning with 3 adults and 15 children. The numbers grew steadily and in 1995 the crèche merged with Beckett School, which was then closing. 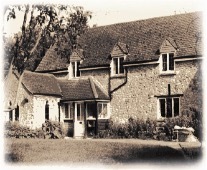 It was renamed The Cottage Nursery and had 125 children, 4 full -time staff and 12 part-timers, located in Beckett Cottage on Park Avenue, Shrivenham within the grounds of the Defence College of Management and Technology. Once the decision to build the Joint Services Command and Staff College at Shrivenham was taken it became clear that the physical limitations of the cottage site would leave many new families without childcare provision when the college opened in September 2000. Alexander Hall, Faringdon Road, Watchfield was identified as being a more suitable site and so the nursery re-located. Thank you to all that dressed up and donated for children in need on Friday, we raised £76.62. This week at The Cottage Nursery we have been remembering. Registered Charity No. 1133631. | Company Reg No. 6535999 (England & Wales). | Ofsted: EY381532.